Cree XP-G2 R5 neutral white LED for better color rendering. 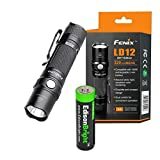 The Fenix LD12 flashlight is the new upgraded version of the popular Fenix LD10. The only LD10 models like the LD20, had to rotate the bezel in order to change the modes. The Fenix LD12 and the LD22 have the new side mode switch in the front that is fast and convenient. This light comes with 4 modes plus the strobe and SOS. The turbo mode is 125 lumens and the lowest mode is 3 lumens which can run for 100 hours. It uses 1 AA battery only weighs 1.9oz. Has the typical tailcap switch and made of durable aircraft-grade aluminum, digitally regulated output so it maintains constant brightness too. Uses a ultra clear glass lens with anti-reflective coating which is a nice touch for a flashlight in the $50 range. The Fenix LD12 is proving itself to be a huge success for the Fenix company just like its predecessor. I would consider using the Fenix LD12 for a wide variety of tasks like packing, utility work, or walking the dogs at night. Fenix LD 12 – Definitely worth the money.